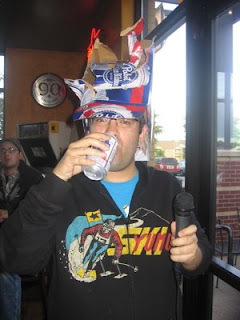 I spent a great deal of this year hosting the Geeks Who Drink trivia night at Illegal Pete's in the DTC. After getting bored of playing my predictable indierock the year previous, I started digging up both enjoyable and cheesy remixes. I actually had a chance to deejay a handful of parties this year as well, which has typically been something outside my range of expertise and it was surprisingly fun. Anyway, as a supplemental mix to go alongside the forthcoming favorite albums of 2008 mix, here is a collection of my favorite tracks, most which I'm fairly certain were released in 2008.